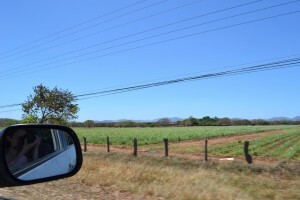 Heading to Costa Rica and debating whether or not to rent a car? If you’re planning to cover a lot of ground and see different parts of the county, a car is definitely the way to go. It gives you the freedom to make your own schedules and not rely on public transportation. It also opens up more hotel and activity options and makes the treks between locations far more pleasant than they would be on a bus. That said, if you’re planning to stay in one spot and your hotel offers shuttles, a car may not be necessary. Reserve them early for better rates. We were behind a couple at the rental agency who were arguing over high rental prices because they hadn’t made an early reservation. We reserved months in advance and our rate was better, as was our car. Get a 4×4. There are a lot of difficult roads in Costa Rica that I cannot imagine traversing with an ordinary sedan. The roads heading into the Monteverde/Santa Elena region are some of the worst we saw – unpaved and very slow-going. We had a Toyota Rav 4, and it served us well. Bring some kind of GPS. I believe you can rent a GPS from most agencies if you don’t have one you can access on your phone or otherwise. Street signs are not ubiquitous as they are in the U.S., and it’s easy to get lost. The GPS was a lifesaver for us. Pay for insurance. It’s worth it for the peace of mind, especially when you’re bumping along the narrow, unpaved roads after nightfall. We woke up one morning to find a scratch and dent on our passenger door and were given no hassle from the rental agency because we were fully insured. Be prepared to drive a manual. Don’t worry, it’s not hard!